Across the globe pictured above, the three solid lines correspond to the northern limit, centerline, and southern limit of Varuna's shadow. The northern and southern limits correspond to a radius of 500 km. The upper and lower dashed lines indicate 1 sigma error. 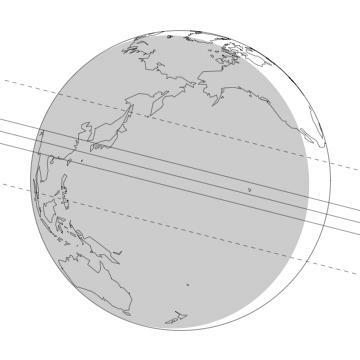 The shaded area represents where the sun is more than 12 degrees below the horizon. The scientific goals of this event are (i) to accurately determine the diameter of Varuna, (ii) to probe for a tenuous atmosphere of Varuna, and (iii) to detect possible nearby satellites of Varuna. Observations are worthwhile and encouraged from any location at which the star is visible, due to the possibilities of the occultation star being a multiple star system or the KBO having a satellite. Either of these could move the event by more than the random uncertainties shown. 3Measured position corresponds to RA offset of +0.2394 and Dec. offset of –0.013. 5The reference position for Varuna is that given by JPL Horizon's ephemeris (Varuna source file: JPL#19; Earth center source file: DE405). 6Data from the USNO 61-inch, SMARTS 0.9m, and Lowell 42-inch telescopes over December 2011 were reduced with respect to stars in the UCAC2 catalog. On 2012 January 2nd, Varuna will occult USNO-B1.0 star number 1162-0144973. The above map and the following prediction results are from the analysis of 69 frames of the occultation star and KBO were obtained using the Lowell 42-inch, USNO-61 inch, and SMARTS 0.9m telescope. Data was taken during the month of December, 2011. 7"Distance" refers to the closest approach distance of the "Site" to the center of Varuna's shadow in the shadow plane. The errors on all closest approach distances are ±1649 km (one standard deviations). "S." means the site is south of the center of Varuna's shadow. "N." means the site is north of the center of Varuna's shadow. 9The errors on all times are ±1:15 (1 minute and 15 seconds; one standard deviation). The solar altitude is given for locations where it is relevant (solar altitude greater than -18°). No entry in the immersion and emersion columns indicates that the occultation is not predicted to be visible at that site. But due to unknown effects (stellar or KBO duplicity), some of these sites may see an occultation event that would be centered on the time in the "UT Mid-Time" column.